D.1-4) In Each group of questions below there are three Conclusions followed by a set of Statements. You have to choose the correct set of statements that logically satisfies the given conclusions. Given statements are true even if they seem to be at variance from commonly Known facts. (Consider all the conclusions are true. All reliance being LG is a possibility. No Sony is LG. (a) Statements: some Nokia are Samsung. all LG are Samsung. all Samsung are reliance. no Samsung is Sony. (b) Statements: All Nokia is Samsung.All Samsung are LG. All LG are reliance.All reliance are Sony. (c) Statements: Some Nokia are Samsung. All Samsung are reliance. All reliance are LG. No Samsung is Sony. (e) Statements: No Nokia is Samsung.. All Samsung are Sony. All LG are Sony. Some reliance are Samsung. possibility. All Irish is jasmine. (b) Statements: All roses are lily.no lily is jasmines. some jasmines are louts.no lotus is Irish. (c) Statements: No rose is jasmine.Some lily is jasmine. Some jasmines are lotus. some lotus are Irish. (d) Statements: No rose is lily.no lily is jasmine. some jasmines are lotus.no lotus is Irish. (e) Statements: some roses are lily.No lily is jasmine. some Irish are jasmine.some jasmines are lotus. All RRB can be SSC. A few TNPSC are not Banking. (a) Statements: Some SSC are banking. some banking is TNPSC. all TNPSC are UPSC. no SSC is RRB. 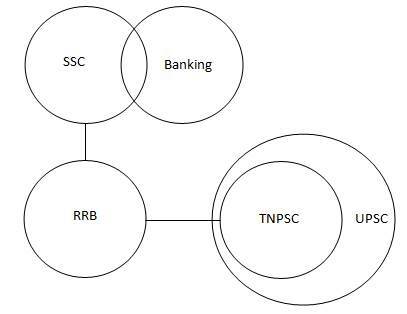 (b) Statements: Some SSC are banking.all TNPSC are UPSC. no SSC is RRB.no TNPSC is RRB. (c) Statements: Some RRB is SSC. no RRB is banking. some banking is TNPSC. all TNPSC are UPSC. (d) Statements: Some SSC is RRB. some banking is SSC. some TNPSC are banking. no UPSC is TNPSC. (a) Statements: Some tall is short. all short is white. some white is black. no tall is British. (b) Statements: All tall is short. no short is white. all black is white. no black is British. (c) Statements: All short is tall. some tall is white. some british are black. no British is white. (d) Statements: All tall is short. no tall is black. some black is white. no white British. 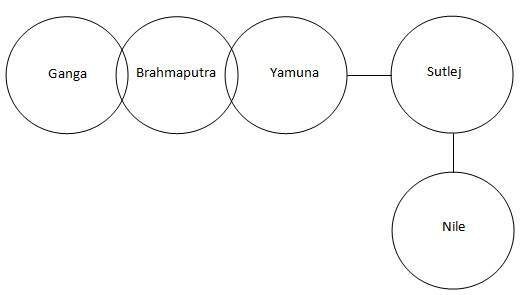 D.5-6) In each of the following questions three/four statements are given and these statements are followed by four conclusions numbered (I) , (II) , (III) and (IV) . You have to take the given statements to be true even if they seem to be at variance from commonly known facts. 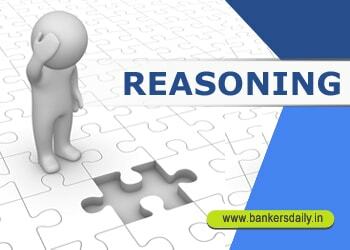 Read the conclusions and then decide which of the given conclusions logically follows from the given statements. Disregarding commonly known facts. Some folk being locking is a possibility. 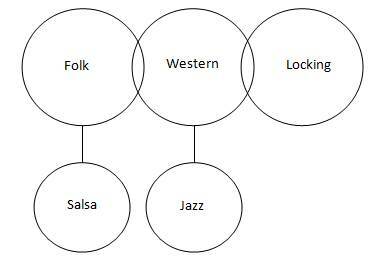 Many jazz are not folk. (b) Only II and I follow. (c) Only IV and II follow. Some Ganga being Nile is a possibility. (a) Either II or IV follows. (b) Either II or IV and I follow. (e) Either II or IV and III follow. D.7-10) In Each group of questions below there are three Conclusions followed by a set of Statements. You have to choose the correct set of statements that logically satisfies the given conclusions. Given statements are true even if they seem to be at variance from commonly Known facts. (Consider all the conclusions are true. Some mouses are not tablets. No laptop is a mobile is a possibility. (a) Statements: Some mobiles are computer. All mobiles are mouses. No mouse is a tablet. No mouse is a laptop. (b) Statements: All mouses are mobiles. Some tablets are computer. No computer is a mouse. Some laptops are mobile. (c) Statements: No mouse is a computer. Some computers are mobile. No laptop is a computer. All laptops are tablet. (d) Statements: Some mobiles are mouses. All mobiles are computer. Some computers are laptop. No mouse is a tablets. No rings is a caps. All pens are pins is a possibility. (b) Statements: Some rings are pins.Some pins are pens. All rings are pens.No pin is a cap. 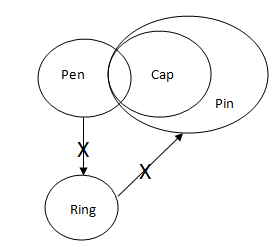 (c) Statements: All rings are pens .No rings is a pin. No pen is a cap.Some pens are pin. (e) Statements: Some pens are caps.All caps are pins. No pen is a ring.No ring is a pin. All glasses are hat is possibility. No monitor is a CPU is a possibility. (a) Statements: All glasses are CPU.All CPU are hat. No CPU is a monitor.No monitor is a glass. (d) Statements: No monitor is glass.All glasses are CPU. All hats are CPU .Some hats are glasses. Some cats are not zats. Some bats are not zats is a possibility. (a) Statements: No zat is a tat. Some bats are cat. All bats are tats. Some tats are cats. 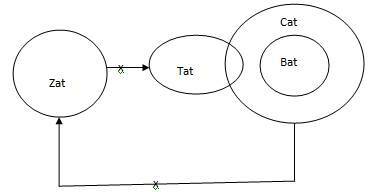 (b) Statements: No zat is a tat. All bats are cats.Some cats are tats. No cat is a zat. (c) Statements: Some cats are bat. All zats are tat. No bat is a zat. No tats are bat. most of the ans is not correct..
Q.1 option C is not a Right Answer..